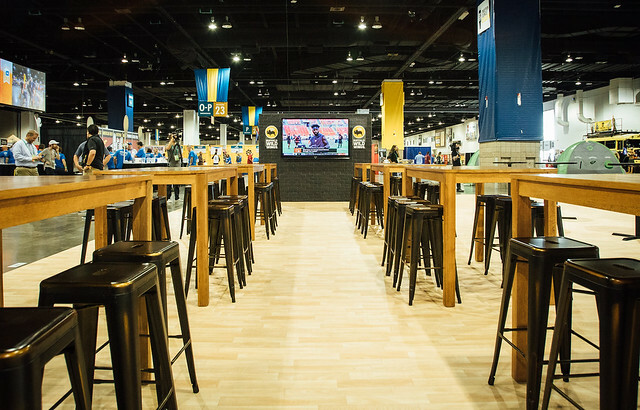 As the nation’s largest pourer of draft beer, Buffalo Wild Wings built a custom 3,600-square foot sports bar at the premier U.S. beer festival – The Great American Beer Festival – for the first time last weekend in Denver, Colorado. Buffalo Wild Wings served 62,000 attendees more than five tons of wings and 36 different beers. Twenty-one of the 36 beers served were Buffalo Wild Wings exclusives, including the Brink Brewing Mango Habanero IPA, modeled after Buffalo Wild Wings’ Mango Habanero wing sauce. The Mango Habanero IPA was designed specifically to be served in the Brink Brewing taproom in Cincinnati, Ohio, and at the Buffalo Wild Wings booth at GABF. Additionally, the Buffalo Wild Wings booth was home to 16 ‘Meet the Brewer’ sessions, including a “Legends of Craft” session on Thursday evening featuring Sierra Nevada Founder Ken Grossman, New Belgium Founder Kim Jordan and Dogfish Head Founder Sam Calagione. They each introduced a new Golden Ale that will be available at Buffalo Wild Wings restaurants on November 19. “At Buffalo Wild Wings, our goal is to create a balanced lineup of beers from local, regional, and national breweries, representing craft, import, and domestic and a broad range of styles that appeals to all beer fans,” said Jason Murphy, Beverage Innovation Manager of Buffalo Wild Wings. GABF, started in 1982, represents the largest collection of U.S. beer ever served, in the format of a public tasting event plus a privately judged competition. Check out the photo gallery below to see additional photos from the three-day event.